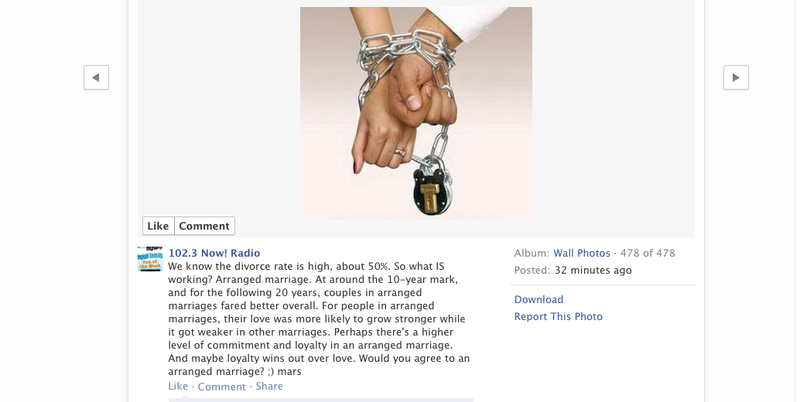 A local radio station has a Facebook page where they post a daily topic and invite listeners to post their two cents. Today’s topic was a tired old retreading of the false divorce stats that conservatives and ultra religious types love to trot out to support their somewhat punitive ideas about relationships and marriage. The gist of their query was soliciting relationship advice from the listeners. What Do You Do To Keep Your Marriage From Ending Up a Divorce Statistic? So while Canadians marry at fairly low rates per capita (with Alberta’s number being the highest, which is a reflection of the economy here more than anything), getting hitched is not a death knell for a relationship. In fact, statistically, you have a greater chance of splitting up if you just live together than you do if you marry the object of your affection. Rob and I have been discussing the “living together” versus “marriage” thing recently. Apparently one of his sisters-in-law suggested to him – a month before we married – that he and I simply try living together first to “make sure it will work out”. The worst advice you can offer a young couple is “live together for a while” because “trial marriages” actually have the worst statistical survival rates. The only non-legal arrangements that fare worse are those of couples who move in together to “save money” on rent or other bills. The only really good reason to live with someone before marrying them is love. Going into a co-habitation without love, and a commitment to a future together, is just asking for the privilege to someday argue furiously over who gets the cat or the flat screen tv. Yes, that’s it. Shower. Together. Every night if at all possible. Okay, sure, open communication. Putting the other’s needs at the top of your to do list daily. Common interests, value systems and goals. And being able to have discussions on a wider range than simply the grocery list and the children. All important. As is, according to new studies, just being consistently kind to each other. Good question because I certainly didn’t shower with the late husband. But with Rob, we discovered very early that the most surefire way to touch base, in a manner of speaking, every day without fail was to take our nightly shower together. You can’t avoid conversation, eye contact and a certainly amount of physicality in a shower – just ask anyone in prison, if you don’t believe me. With a small child, the shower became the logical “get away” when we were on holiday and cramped together in a single hotel room, and it has always been a good way to reconnect at the end of long days when other contact was limited. I’d like to add that it’s a good way to conserve water and soap, but that just hasn’t been a side benefit. I couldn’t take a shower with my husband if I actually wanted to get clean (in fact I specifically remember telling him “no, you can’t get in with me, I’ll be late for work!”) but we did shower together sometimes for entertainment purposes. We always had our best talks while in the car–our daughter was a night owl as a toddler, and for a long time, we would drive and talk for an hour every night as we tried to lull her to sleep. Good memories. Used to drive around the freeway loop to get Dee to take a nap on days when both she and her dad were making me crazy. He would nap too. Not good memories really. Dee is not a car sleeper today though. When she falls asleep in the backseat, I start to worry b/c either she is sick or Rob and I have been awake too long w/out a break. Yeah, Gillian’s not a car sleeper anymore either, although she can sleep on airplanes and I can’t – we took a red-eye flight a few years ago, and I watched the sun rise over the East Coast while she snored beside me. You articulated it beautifully. Short car trips together have often worked similarly for me in the past, but showering together is indeed a great way to connect. “Just ask anyone in prison” I about fell off my chair laughing. It’s so true! So basic! I love it! Thank you for another great item to read. With teenagers in the house showering at night rarely works, but morning showers after they’re off to school are a lovely way to share a little time before facing a day at work. Didn’t with my ex because he had to have really hot water and I can’t tolerate it. He would never have enjoyed washing my hair, either. . .
Dee isn’t old enough for the questions about our showering together to lead her to other observations. My late husband couldn’t stand water above the barest of lukewarm and I like it hot, so showering with him was too much of a thermal challenge. And though I love to have my hair washed by someone else, the “someone else” has nearly always been a hair stylist.